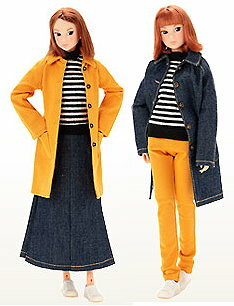 I am an authorized seller of Sekiguchi Momoko dolls. I ship from Canada, Canada Post requires a telephone number for International shipments. When your order arrives I will send you a Paypal invoice for Balance owing. International orders, when your order arrives, I will send you a Paypal invoice for balance owing plus the additional shipping for International Shipping. The above are an approximate amount only. When the order arrives I will calclate shipping on your actual address. All deposits are non-refundable unless the doll is not available to dealers. The PetWORKS dolls on this page are all from my collection, my daughter's or a close friend's collections. Sometimes I end up with some to sell. My daugher and friend have a standing order for new dolls, because I can't always contact them and say "Do you want this one?" in time for me to order the doll. It's complicated!!! When a new Momoko comes out I always buy 3, one for me, one for my daughter, and one for my friend. Sometimes my daughter or friend don't like the dolls when they see them and just tell me to sell them, so I put them here on my site so I can offer them to Momoko/Ruruko lovers at retail value instead of inflated eBay prices.